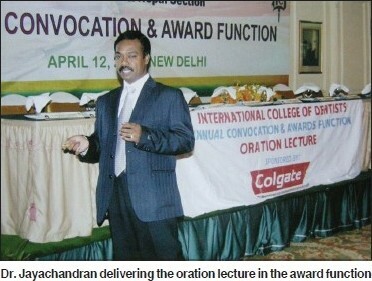 Professor Dr. S. Jayachandran, Department of Oral Medicine and Radiology, delivered an oration lecture at the ICD Annual Convocation and award function held on Sunday, April 12, 2009, at the Essex Convention Centre, Essex Farms. The topic of oration was Biomedical waste management in practice. He highlighted the importance of biomedical waste management, the current scenario in health care institutions, biomedical waste management and Handling Rules 1998, and a systematic approach for managing biomedical waste, discussed the handling of special situations like blood spills, mercury spills, and discussed about the universal precautions and postexposure prophylaxis of HIV. All the participants, office bearers, President of ICD Dr. Samraj T., Secretary, Dr. J. C. Chandna, and Executive Councilmen Dr. Anil Kohli, Dr. Mahesh Verma, and Dr. S. M. Tanija appreciated his presentation.